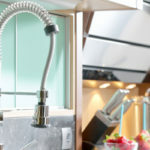 There are so many ways you can go green with your kitchen remodel, from purchasing eco-friendly materials to designing your kitchen to reduce future electricity usage. Our long-lasting cabinets, countertops, and other kitchen appliances are proven to stand up to the test of time. As a result you won’t have to replace them anytime soon, which is already a win for the environment as well as your wallet. 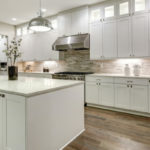 We are here to help you get the kitchen of your dreams on any budget, and if you want to go green Tops Kitchen Cabinet is here to help you with that too. Here are 15 ideas for the perfect eco-friendly kitchen both you and Mother Nature will love. Ask us about eco-friendly kitchen cabinets and we can help you get the cabinets of your dreams without further damaging the environment. Make sure your kitchen appliances are approved by the Environmental Protection Agency’s (EPA) Energy Star program. Energy Star appliances are proven to reduce energy usage by as much as 10% to 50%. This is not just better for your electric bill, but it is also better for your heath. According the US EPA, Americans spend 90% of their life indoors. Unfortunately, indoor air pollution is much higher than outdoor air pollution, by as much as 10 to 100 times. The kitchen is a huge contributor to indoor pollutants through fumes and gasses released by cooking appliances. 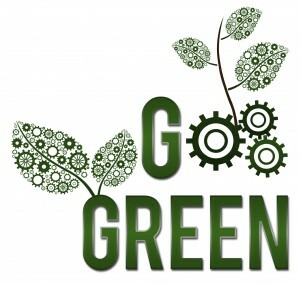 Having the proper filtration systems and green appliances helps reduce harmful indoor pollutants. 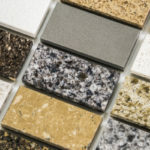 Recycled materials for kitchen remodels are becoming more and more popular, and that’s a good thing for planet Earth. You can use recycled windows, wood cabinets, and pretty much anything else. Get some great ideas by scoring your local swap meet or fleet market; you may also find great materials online. Using recycled materials saves money and reduces the impact of new manufacturing as well as the rate we load up landfills. Many times the recycled elements of kitchens are the greatest highlights, the parts that contribute to conversation and endless compliments. It’s not just other peoples’ recycled goods that make great alternatives to buying brand new. 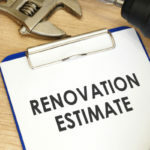 Your own furniture that seems old or outdated can be completely refreshed with a new coat of paint, or a few other small changes. Pick out a fabric you like and make sure you have enough of it. Remove the bench or seat cover currently on furniture. Wrap the new fabric tightly around to cover the entire bench or chair cover and secure fabric on the underside with fabric staples. Re-secure the chair cover or bench and you have an entirely new look! Instead of fancy lighting fixtures focus on adding ceiling fans to your kitchen. Kitchens produce a lot of heat, especially on hot days. Simply turning on the oven for 45 minutes can greatly increase indoor temperatures. As a result, you’re going to crank on your air conditioner and put harmful pollutants into the atmosphere. The more you reduce AC-usage the better off the environment is. It’s amazing how much difference a ceiling fan can make in terms of cooling down the kitchen without turning on your AC. If you enjoy a good cup of Joe at Starbucks, Coffee Bean or any other coffee shop you will benefit from adding a coffee station to your newly improved kitchen. Being able to make your own coffee at home reduces the gas you use driving to coffee shops and also saves a considerable amount of money. With the cost of lattes around $4 each, even extremely high-end devices can pay for themselves in a couple short months. Kitchen paint, flooring and wood preservations output toxic fumes that can cause eyes, nose, and throat irritation as well as cancer. Thankfully, there are VOC-free eco-safe paint options that are far friendlier to your health and the environment. Windows naturally make your kitchen look larger but they also reduce your electricity by letting in plenty of natural sunlight. Simply adding long-lasting cabinets and countertops helps reduce your overall footprint on the environment. The longer materials are able to last the longer it is before you have to order something new, thus decreasing manufacturing needs. Manufacturing has a hugely negative impact on our environment, any way you can reduce your consumption of new things helps. Take a moment to think about how much waste is thrown away in your kitchen on a daily basis; now multiply this by a month, year, and then your entire neighborhood. All in all, we produce way too much trash for our Planet to handle. Your next kitchen remodel can help reduce this huge build up of waste by adding a compost pile. The EPA reports a total of 254 million tons of municipal solid waste produced in 2007 in the US alone. 12.5% of this waste was related to food waste. In fact, Americans throw away 25% of the food we make each year. We need to reduce methane emissions, something food in landfills makes much worse, contributing as much as 34% of all methane emissions in landfills. It is much better to dispose of food in small piles, such as at your own home. If you have space on your property to put a compost pile you can really help the environment. Bugs are going to come, they are part of the decomposing process, so make sure the pile is far enough away from your house to not matter. Every kitchen should have at least two trashcans, one used for trash and the other for recycling. Anything with a triangle logo on it can and should be recycled. Having two separate spaces designated for trash and recycling will help you and your guests properly sort waste. Some of the most popular cleaning products on the market are laden with dangerous chemicals known to cause many health issues, including cancer. Thankfully, the market for green non-toxic cleaning supplies has ballooned in recent years. When stocking up your kitchen cleaning supplies keep this in mind. You can also save money and protect your health as well as the environment by doing regular cleaning with products you already have on hand such as baking soda and vinegar. Bigger isn’t always better, instead it’s about serving your needs. Your kitchen hogs up the greatest amount of energy compared to other parts of the house. The appliances you pick will greatly impact just how much more energy your kitchen uses. A huge refrigerator or an oversized microwave is naturally going to use up more energy. Before going big and never looking back consider what you need each appliance for. If you are not a big microwave user, opt for a smaller model. If you don’t have a big family, a smaller refrigerator is going to be more cost effective. Once your kitchen has already been installed you are going to be excited to cook in it. By breaking some old habits you can further reduce your ecological footprint. For example, it is very common to use the oven to bake chicken while simultaneously using the stovetop to stir-fry some veggies. An easy way to instantly reduce the amount of electricity your kitchen consumes is to use the oven to cook all of your ingredients when it is already in use. Since the energy is already being produced you might as well make the most of it and leave other energy sources alone for the night. Organic, green, and eco-friendly are all terms that better the environment but they don’t always come with a cheap price tag, in fact there is typically an increase in price for anything eco-friendly. Save money by buying wholesale kitchen cabinets, countertops and more at Tops Kitchen Cabinet. We save you money so that you have more room in your budget to go eco-friendly in other ways.